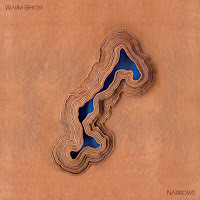 ‘“It’s all about making our music more challenging to the ear,”’ state Oliver Chapoy and Paul Duncan from Warm Ghost as they describe their debut album titled Narrows and I couldn’t have hit the nail in the head any better when it comes to picking out what this project resembles. Upon listening you’ll find an over abundance of synthesizers, a subtle cooing of lyrics, and a mess of noise in the background. Should this be appeasing to your taste then I would definitely say you give Warm Ghost a go. Normally, I do my best not to judge a book by its cover (in this case I mean basing the entire album off of the first track), but “G.T.W.S.” which is, yes you guessed it, the first track off the album, sets a high standard for the rest of a mediocre album. I do, however, give immense credit for this being a highly unique and independently created piece of art. When I keep that in mind I find it easy to lose myself in track after track - appreciating the oohs and aahs with each turn of the beat. So, when this album is released on September 27 hunt it down on their website www.warmghost.com and be sure to stay tuned for upcoming tour dates as this spectacle would be something to experience first-hand.